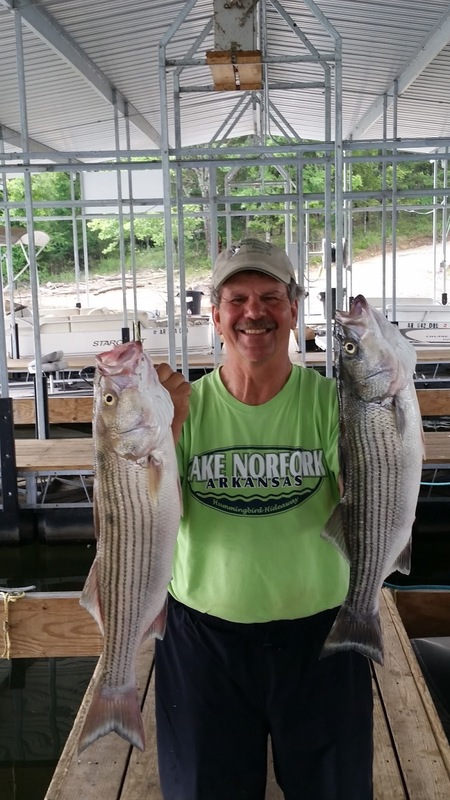 Striped Bass fishing on Norfork Lake has been outstanding for the last couple of weeks. 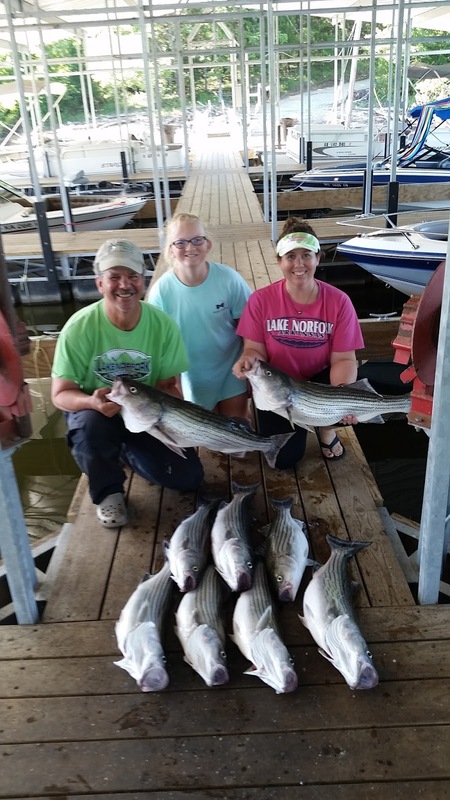 This year the stripers are in the summer pattern a little earlier than normal. You can find the striped bass in 40 - 55 feet of water close to the bottom. Early morning, after sunrise, I have been finding large schools of fish feeding heavily on shad. 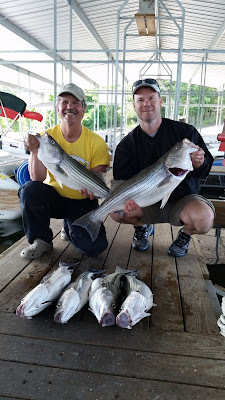 As the morning wears on the stripers are staying at this same depth, but will be hugging the bottom. Small live bait is working the best for me, either threadfin shad or shiners. For my live bait poles I am using a 2 ounce weight with a swivel on both ends, then I tie on a 4 - 5 foot leader with a # 6 hook. Yes, this is a very small hook, but I try to match the hook to the bait so the bait can still swim around. I drop the bait to the bottom then give 2 cranks of the reel to lift the weight off of the bottom. Best places to fish are from point 2 back to the Sand Island area. 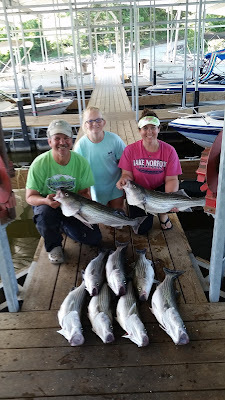 Start looking for the stripers on the points and both sides of the points and when you find them hold on! The largemouth bass bite is also very good. They can be found all over the lake. The best areas to start fishing is part way to all the way back into the creeks and coves. The largemouth are up in the sunken brush early and late in the day and move out to 20 - 30 feet of water during the sunny part of the day. Swim baits, plastic worms, crank baits and spinner baits are all working well at times for the largemouth bass. The largemouth will also come up for a topwater bait early in the morning. Crappie, bluegills and walleye are all feeding inside of the sunken brush early and late in the day. The crappie and bluegill stay inside of or on the edge of the brush during the day. The walleye are starting to move out onto the flats into 20 - 40 feet of water. 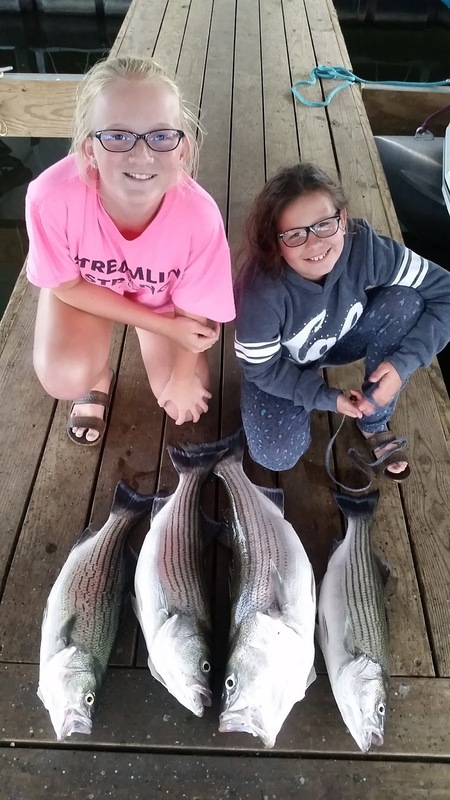 Live bait is a great choice for all these species. Norfork Lake level is falling slowly with sporadic power generation and is dropping 1 - 2 inches per day. The current level is 573.15 feet above sea level. The majority of the lake is clear with the creeks and coves partially stained. The lake surface water temperature was 81 - 82 degrees this morning.